Dr. Christian R. Holmes is credited with numerous contributions not only to science and medicine in general, but also to medical education. Indeed, he is remembered not only for his expertise in Otolaryngology and Ophthalmology, but also for his profound influence on the history of the University of Cincinnati’s Medical College and it’s collaboration with the surrounding municipal hospitals – Cincinnati’s General Hospital in particular. For this reason, some unhesitatingly compare him to the famed Dr. Daniel Drake who first established the Medical College and soon after more-or-less effectuated the creation of the Cincinnati General Hospital’s institutional with the intention of their collaboration. Dr. Daniel Drake. This photo serves as a link to the finding aid for the Winkler Center’s collection on Dr. Daniel Drake. This original establishment, a public hospital “[once] situated at the northeast corner of what is now known as Twelfth and Central Avenue,” began receiving patients in 1823 and was officially recognized as the “Commercial Hospital of Cincinnati” in 1861. However, by 1865 the hospital had already become poorly equipped to handle the intense demands of the surrounding community; a new hospital was built on the same site, opening in 1869. This “Cincinnati Hospital” unfortunately soon also proved to be inadequate and by the 20th century, the buildings had become aged and dangerously neglected. “Block Plan” of the Johns Hopkins Hospital (left). 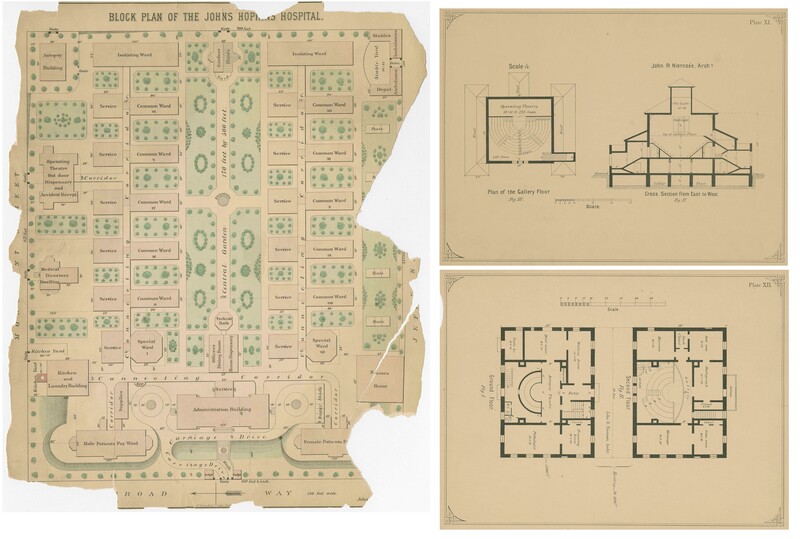 Johns Hopkins amphitheater architectural plates-plans (right). These and other architectural plans were consulted when considering the design of Cincinnati’s General Hospital. Dr. Christian R. Holmes was a member of the Cincinnati Hospital’s Board of Trustees when it appointed the committee that assessed the cost of repairs. The repairs were never effectuated, however. When State Legislature passed a bill financially empowering the Board in 1902, it was instead officially decided to reallocate resources into the creation of an entirely new hospital. Drs. A. B. Isham and Holmes were appointed to explore and recommend locations for what would become the foundational structure of the Cincinnati General Hospital. They recommended the current location in 1903. Dr. Holmes was appointed Permanent President pro-tem in 1910, becoming part of the new and permanent Board of Hospital Commissioners. And after massive expenditures, the completed hospital opened in 1915. Within the following year the old “Cincinnati Hospital” was completely dismantled. Cincinnati General Hospital’s intended ‘block plan’ (left); the Surgical Pavilion is enlarged (upper-left). Cincinnati General Hospital’s “Operating Pavilion”/ Surgical Pavilion architectural plans (right). Operating Pavilion/Surgical Pavilion. This image serves as a link to information on a brief historical account of the University of Cincinnati. “The first floor of the surgical pavilion contains a large amphitheater with a seating capacity of 250. On this floor are also two large operating rooms, with their suites of sterilizing rooms, surgeons’, nurses’, and students’ preparation rooms, anesthetizing rooms, and recovery rooms. On the second floor are two smaller operating rooms and a dental operating room and laboratory. In the basement is located one of the most complete x-ray departments in this country and the drug department. The amphitheater and several operating rooms in the surgical pavilion are used for operative clinics and clinical lectures. Clinical instruction in both medicine and surgery and in the specialties is given in the eight large general wards and buildings of the hospital, and in the seven set aside for the infectious diseases.” (from page 36 of the College of Medicine: Annual Announcements 1919/20-1922/23). Much like Dr. Drake’s intentions for the original hospital, Dr. Holmes envisioned the new hospital not only serving the community but also the College. Also like Dr. Drake before him, Dr. Holmes served as the Dean of the Medical College beginning his term on January 16, 1914. ‘Surgical Amphitheater’ sometime early-20th century. It is perhaps interesting to note that, at the time of its opening, for practical reasons the Cincinnati General Hospital was situated, more or less, in the geographic center of the city; the Surgical Amphitheatre then situated in the center of the hospital, was more or less at the center of Cincinnati. In many ways the Amphitheater continues to be a symbol of the long-venerated union of medical practice and theory. Though perhaps vestigial in nature, its existence today is far from obsolete –it is profoundly monumental. It is a representation of the venerated collaboration between the Medical College and the Cincinnati General Hospital which was started by Dr. Drake but thoroughly maintained and encouraged by Dr. Holmes. Dr. Holmes fell ill and passed away at a relatively young age. Unfortunately, as is frequently the case, few sources still exist that really speak to his personality and character – Dr. Martin H. Fischer’s famed biographical work, Christian R. Holmes Man and Physician may be considered among them. However, if anything, it is clear from his impressively extensive involvement and rhetorical voice that he was an extremely determined individual. He was respected then, and is respected now. In 2005, a 5-year, $250,000 restoration of the ‘Surgical Amphitheater’ was undertaken and included: comprehensive repairs to the original skylight, new windows, as well as new heating and cooling systems; funding for the project was provided by the University of Cincinnati Department of Surgery, University Hospital (now known as University of Cincinnati Medical Center), the Mont Reid Surgical Society, and University Hospital medical staff and auxiliaries. The amphitheater and nearby space now also feature permanent installations of historic artifacts such as various anatomical drawings by noted medical illustrator Mary Maciel. 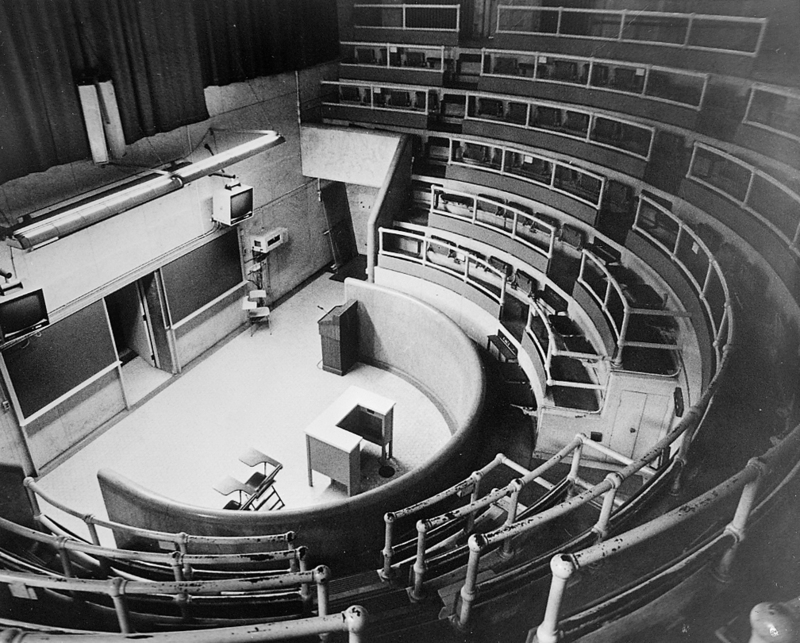 Currently, the ‘Surgical Amphitheater’ is used for weekly grand rounds – its original purpose! A special thanks to Roger West for scanning many of the featured photos from the Roger West Department of Surgery Archives.